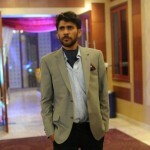 Are you suffering from constipation and want to get rid of it immediately? Or does the fear of contracting cancer keep you awake at nights? There is one ingredient that can keep these issues, and many others, at bay! If you are wondering what is it we are talking about, it is nothing but Sorghum, a grass native to tropical and subtropical climates. Would you like to know the many other Sorghum benefits? Please continue reading! Sorghum contains a good amount of dietary fiber (48% of the recommended dietary fiber needed daily) and helps improve digestion. Dietary fiber is a bulking agent that adds bulk to the stool and helps it pass smoothly through the digestive tract. Sorghum helps improve digestive health and treats conditions like gas, diarrhea, bloating, constipation and stomach ache (1). Sorghum’s bran layer contains many cancer-fighting and free-radical eliminating antioxidants that are essential for the body. Some of these antioxidants are exclusive to Sorghum and thus, Sorghum becomes an effective anti-carcinogenic. Antioxidants help purge free radicals, which otherwise can change the body’s healthy cells into cancer cells (2). Sorghum, as already discussed, is crammed with dietary fiber. The abundant fiber in Sorghum helps reduce LDL (bad) cholesterol from the body and reduces the risk of heart attack and other arterial conditions (3). Celiac disease is a comparatively new condition, which is basically characterized by a gluten allergy that can have severe symptoms. Gluten is a widely used ingredient that makes the life of celiac disease victims quite hard. If you suffer from celiac disease or know someone who does, adding Sorghum and other grains apart from wheat is the best thing to do(4). 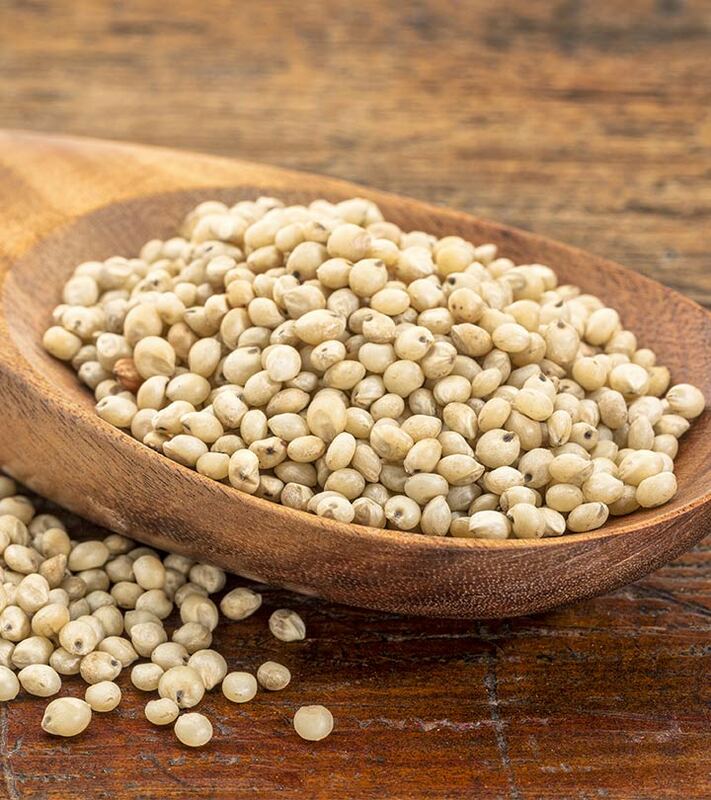 You can eat Sorghum without suffering from inflammation, gastrointestinal damage, and nausea. Sorghum helps you control your diabetic tendencies. Excess carbohydrates usually break down simple sugars and increase the body’s glucose levels that often leads to diabetes. Sorghum is rich in tannin, which contains enzymes that prohibit starch absorption by the body (5). This property helps regulate insulin and glucose levels. A balance in the levels ensures that diabetics don’t have to suffer sudden spikes and drops in glucose levels, thereby preventing diabetic shock and other complications. Magnesium is one of the major ingredients of Sorghum. Magnesium increases calcium absorption that helps maintain calcium levels, and this in turn helps promote bone health. Calcium and magnesium helpquicken bone-tissue redevelopment and also accelerate the healing of damaged and aging bones. This can in turn help prevent conditions like arthritis and osteoporosis (6). Sorghum is rich in many minerals, including iron and copper. Like magnesium boosts calcium intake, copper boosts iron intake. An increase in iron means better oxidization of blood, and this leads to better oxidization of tissues, muscles, organs and the body. This oxidization is a result of RBC production that is boosted by iron. As more RBCs are created, blood circulation continues to improve. The iron levels ensure that you don’t contract anemia, which leads to a reduction in RBC production, cell damage, and no cellular growth (7). Sorghum contains Niacin, also known as Vitamin B3, which helps turn food into energy for the body. Vitamin B3 metabolizes nutrients and helps maintain energy levels throughout the day (8). One of the most effective health benefits of Sorghum is preventing Melanoma. We know that Sorghum contains many cancer-fighting antioxidants that can help treat cancers. 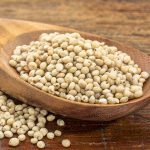 Sorghum is also quite effective in treating melanoma (a special type of skin cancer), which is characterized by pigment-containing cell growth on the body. The tanning in Sorghum may have restrictive effects on melanoma cells (9). Sorghum is crammed with essential nutrients that are not only necessary for development, but also help keep the body free from diseases and maintain its health (10). Now that you know a considerable amount about sorghum nutrition, let us know if you’ll give this a try. So, get your hands on some Sorghum grass and tell us about your experiences here. Leave a comment below!